The Hannibal Lecter franchise is an American media franchise based around the titular character, Hannibal Lecter, a brilliant, cannibalistic serial killer whose assistance is routinely sought out by law enforcement personnel to aide in the capture of other criminals. 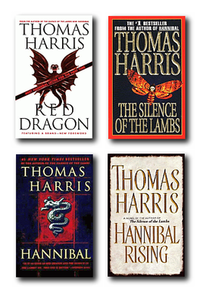 He originally appeared in a series of novels (starting with Red Dragon in 1981) by Thomas Harris. The series has since expanded into film and television. The first adaptation was the 1986 film Manhunter, which was an adaptation of Red Dragon, directed by Michael Mann. The next adaptation was 1991's The Silence of the Lambs, which was directed by Jonathan Demme and was the first film to feature Anthony Hopkins in the role of Hannibal Lecter, which was remade as Sangharsh in 1999. Silence was a success, both critically and financially, and went on to become the third film in Academy Awards history to win in all top five categories (Best Actor for Hopkins, Best Actress for Jodie Foster, Best Director for Demme, Best Adapted Screenplay for Ted Tally, and Best Picture). Hopkins reprised the role in the next two films, 2001's Hannibal, a sequel directed by Ridley Scott, and 2002's Red Dragon, a prequel directed by Brett Ratner. In 2002, Hopkins revealed that he had written a screenplay for another sequel, ending with Clarice killing Lecter but it was not produced. In 2007, Hannibal Rising was released. The film is a prequel, directed by Peter Webber and starring Gaspard Ulliel as Lecter. In 2013, the TV series Hannibal premiered. Developed by Bryan Fuller, it is not a direct adaptation, but based on characters and elements from the novels. Some male characters have become female, such as Freddy Lounds, who is renamed Fredricka "Freddie" Lounds. The series has garnered much critical acclaim since its premiere, winning the 2014 and 2015 Saturn Award for Best Network Television Series, as well as the inaugural Best Action-Thriller Television Series in 2016. In 2016, when asked if there were any sequels that he wished he could revisit, Hopkins said, "I made the mistake of doing two more [Hannibal Lecter movies] and I should have only done one." In 2017, Foster reprised her role as Starling in a skit titled "Clarice Probes Hannibal Lecter About Trump's Russia Ties" on The Late Show with Stephen Colbert, opposite Stephen Colbert as Hannibal Lecter. In the skit, Clarice questions Lecter on his relationship with Donald Trump and what he can tell her about his relationship with Russia. In 2005, comedian-musicians Jon and Al Kaplan, most famous for their musical re-imaginings of popular films as YouTube musicals, parodied The Silence of the Lambs, especially the film version, in Silence! The Musical. It premiered Off-Off-Broadway and has since had acclaimed productions in London (2009) and Los Angeles (2012). In 2012, it won the Los Angeles Drama Critics Circle – Score, Lead Performance, Choreography Award. ^ Oldenburg, Ann (October 3, 2002). "Marquee names serve up another helping of Hannibal". USA Today. Retrieved April 19, 2013. ^ Hibberd, James (7 December 2016). "Westworld finale: Anthony Hopkins on Dr. Ford's fate". Entertainment Weekly. New York: Time Inc. Retrieved 13 February 2017. ^ VanDerWerff, Todd (March 8, 2014). "Hannibal's Bryan Fuller on blending Busby Berkeley with murder". The A.V. Club. Retrieved March 8, 2014. Kade Prurnell is an anagram of a character from Hannibal, actually the Ray Liotta character. So it’s like, “Your anagrams are showing, Dr. Lecter.” We couldn’t get the rights to that character, because that character originated in Silence of the Lambs. The character’s name was Paul Krendler, and we wanted to call her Paula Krendler, and they said no, because the way the rights go, it’s not by the literature, it’s actually by the character’s introduction. So if a character is first seen in Silence of the Lambs, we’re screwed, as far as rights go. In order to change the character so it’s not that but sort of services the same mythology in the show and reinvent the character in a way that won’t get us sued, [Laughs.] we anagrammed her and made her slightly different from the character in both Silence of the Lambs and Hannibal to our own purposes. ^ "Manhunter RT: Reviews". Rotten Tomatoes. Retrieved 2014-01-11. ^ "Manhunter MC: Reviews". Metacritic. Retrieved 2014-01-11. ^ "Silence of the Lambs RT: Reviews". Rotten Tomatoes. Retrieved 2014-01-11. ^ "Silence of the Lambs MC: Reviews". Metacritic. Retrieved 2014-01-11. ^ "Hannibal RT: Reviews". Rotten Tomatoes. Retrieved 2014-01-11. ^ "Hannibal MC: Reviews". Metacritic. Retrieved 2014-01-11. ^ "Red Dragon RT: Reviews". Rotten Tomatoes. Retrieved 2014-01-11. ^ "Red Dragon MC: Reviews". Metacritic. Retrieved 2014-01-11. ^ "Hannibal Rising RT: Reviews". Rotten Tomatoes. Retrieved 2014-01-11. ^ "Hannibal Rising MC: Reviews". Metacritic. Retrieved 2014-01-11. ^ "Hannibal: Season 1". Rotten Tomatoes. Retrieved 2017-12-11. ^ "Hannibal Reviews". Metacritic. Retrieved 2017-12-11. ^ "Hannibal: Season 2". Rotten Tomatoes. Retrieved 2017-12-11. ^ "Hannibal: Season 3". Rotten Tomatoes. Retrieved 2017-12-11. This page was last edited on 29 March 2019, at 12:34 (UTC).